Checking Out Chiang Rai: The Perfect 1-Day Itinerary — 2checkingout | travel and adventure | Inspiring. Capturing. Experiencing. Most people have heard of Chiang Rai's iconic White Temple. But what about its other colourful attractions and things to do? Is it worth the trek from Chiang Mai? Well, yes, two nights with one full day is the perfect amount of time to experience what this small city has to offer. The VIP bus from Chiang Mai is the easiest and most comfortable way to pass the 3 hour journey. A quick 5 minute walk from the bus station is the friendly Guesthouse, Grandma Kaew’s. Arriving in Chiang Rai late morning leaves you a few hours to explore downtown and hire a scooter from Chiang Rai Big Bike Rentals ready for tomorrow's adventure. A scooter is a quick and practical way to hit the key attractions at the best time of day. Spend the evening hanging out with the locals at the Night Bazaar. Skip the more touristy and expensive teak restaurant area, opting for the open air foodcourt with food stalls down each side. Soak up the local live music show whilst you cook your own Pad Thai at your table. Ready to kick off the day? Don't forget to dress modestly for the temples with covered knees and shoulders. Set your alarm early. To get the best of the number one attraction, you need to be there early to beat the crowds. Head off between 7.00am - 7.30am if you can on the main road south (Highway 1) towards Doi Luang National Park and Lampang. Watch the traffic on this busy dual carriageway. At times you can ride on a parallel side road which is less hair-raising. At first sight, the temple is striking, its mirrored mosaics glimmering in the early morning sun. Before you pay to enter, grab some wide shots across the water before too many people in their garish shirts crash your pictures as they cross the temple bridge. The 50 baht ticket price is great value for this unconventional, contemporary work of art. Privately owned by Chalermchai Kositpipat who designed, constructed and opened it to the public in 1997. Construction is still ongoing. Take your time soaking up the intricate details. You can't miss the sea of hands reaching out to grab the sinners, pulling them into the underworld. 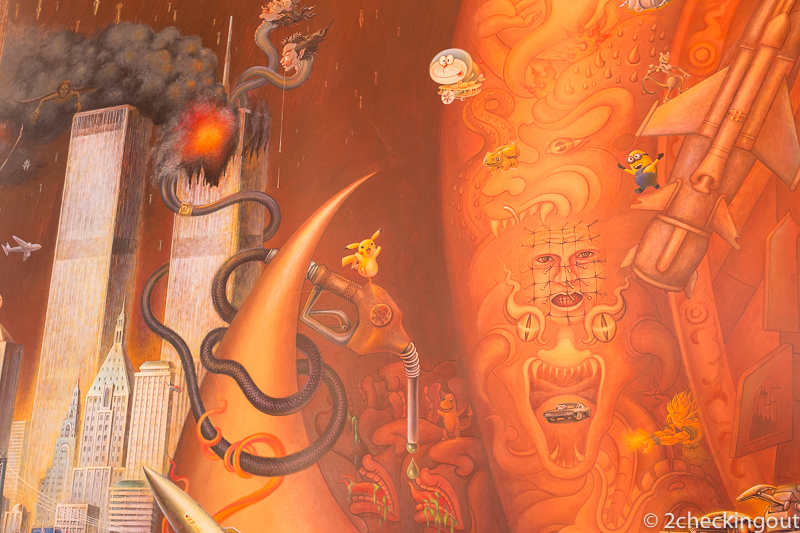 The mural inside the main building, Phra Ubisoft, is particularly unique depicting western idols such as Michael Jackson, Harry Potter and Superman as well as techological developments like mobile phones and nuclear weapons. 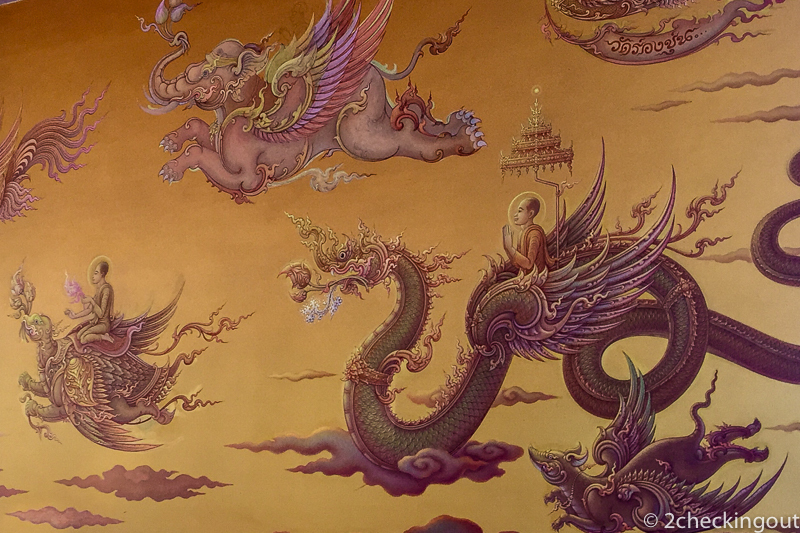 This melds around the walls to more peaceful images of worshipers floating on clouds towards the Buddha. No photos are allowed inside which is disappointing (we may have snuck a couple of photos). It's worth looping back around for a second look. The grounds are also worth exploring, lots of little details, with traditional Thai as well as Western references, such as the Freddie Kruger head. 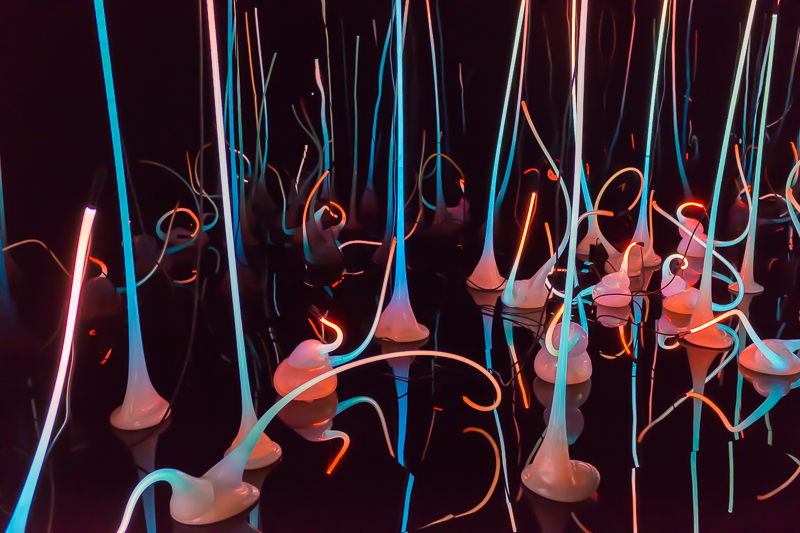 The ticket price also includes an exhibition by Kositpipat, which shows how his unusual style has evolved. Turning left out of Wat Rong Khun, you can take the back road back towards Chiang Rai, passing Singha Park. A fairly clinical looking place that is too large to walk around. You can hire bicycles (150 baht p/hour) or take the electric shuttle tour (50 baht p/person, 1 hour, in Thai). We skipped this as it felt quite pricey and touristy. Still good for a quick stop for a cold drink and a photo with the infamous golden lion. Heading back toward Chiang Mai, scoot passed the town onto Highway 1 north. A little way out you will find another unusual artistic creation by Thawan Duchanee (located at 414 Moo 13, Chiang Rai). Almost 40 wooden, glass and concrete structures in various styles litter the large grounds. 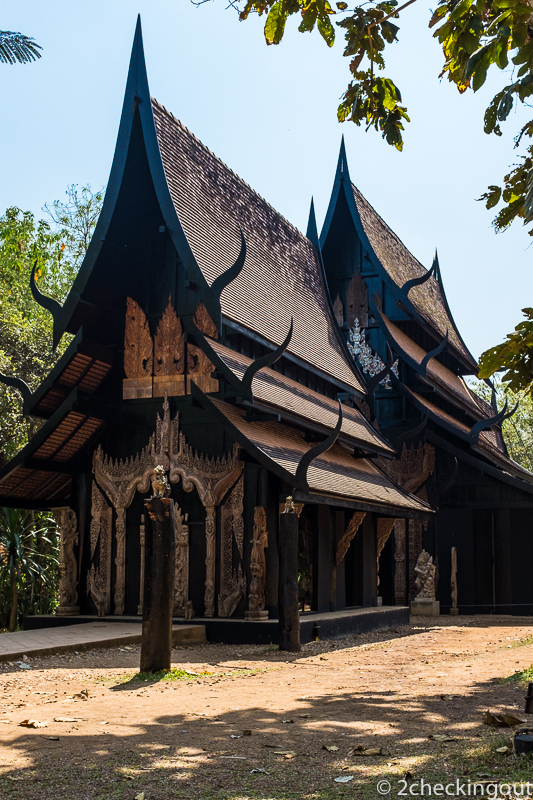 Inside many buildings you will find Thawan's collection of paintings, sculptures, animal bones, skins and horns. Being animal loving vegetarians this didn't really do it for us, we preferred the outside architecture instead. Eighty baht entrance, with a number of restaurants nearby. A good place to take a break for an early lunch after exploring the museum. Heading back toward Chiang Rai, before crossing the Mae Kok river you will find Rong Sear Tean (located at 306 Moo 2, Rim Kok, Muang Chiang Rai). Smaller than the White Temple, but still packing a 'wow' punch, a blue one. Completed in 2016, the contemporary Buddhist art is simultaneously striking and peaceful. 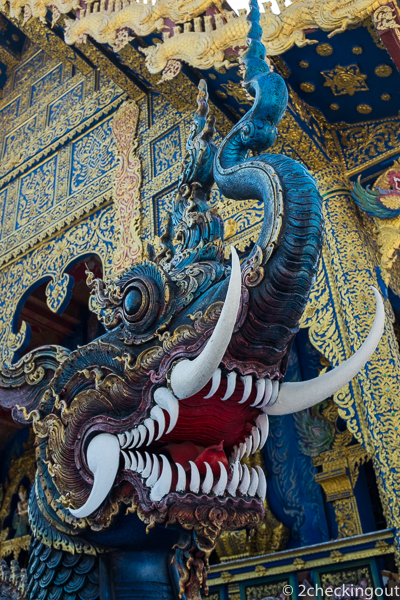 With no admission fee, the Blue Temple is a unique and welcome addition to the multitude of Thai temples. Head back toward the town centre. 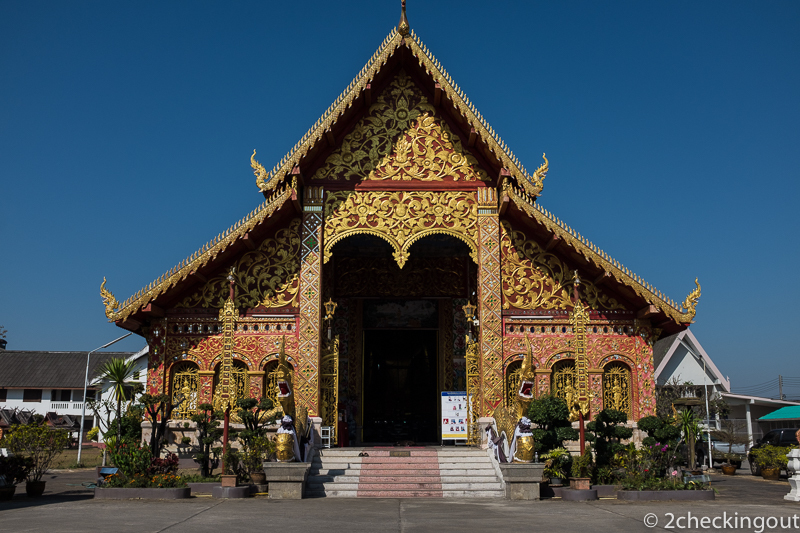 Wat Phra Kaew is a few streets north (located on Trairat Road, Wiang sub-district, Muang Chiang Rai). Understated but still one of the oldest and most famous temples in Thailand. Wat Phra Kaew was the original home for the translucent green Buddha which graces the Emerald Buddha Temple in Bangkok's Grand Palace. It was discovered in 1434 after lightening struck an old Chedi. In October 1991, a replica carved out of Canadian jade was installed in the Wat. Cruise back down the main street towards Grandma Kaew's. Cat n a Cup is on the corner of Prasopsook Road and Phaholyothin Road (located at 430 Prasopsook Road, Chiang Rai). Not a cat person? Neither are we! But the curiously diverse selection of kitties sways even the hardest anti-feline heart. Great coffee, icy cold air conditioning and kitty kisses make this a perfect place for an afternoon break. Escape the heat with an afternoon snooze and shower back at Grandma's, before venturing out for the evening. Time for a mooch around town before dinner. Easily walkable from Grandma Kaew's, this small temple felt well loved and used by the locals. The large seated Buddha was undergoing a new golden spray paint when we visited. Pick a spot for a pre dinner beer or cocktail and watch the world go by. Jet Yod Road is the perfect place with a number of bars and cafes. Head towards Barrab for dinner, stopping at the nearby Clock Tower to see the light and sound display. At 7pm, 8pm and 9pm nightly. A fairly unusual attraction to say least. This large clock tower which acts as a traffic roundabout undergoes a nightly light and sound show. For about 7 minutes loud music blares out whilst brightly coloured lights sweep over the clock tower. And the traffic keeps swinging by as tourists snap their pictures. A 3 minute walk from the Clock Tower, you will find Barrab (located 423/3 Banphaprakan Road, Chiang Rai). Full disclosure, we didn't eat here by we tried to! It was closed for some renovations. The menu looked delicious with veggie and non veggie options. The reviews for food and service look great too. Alas, it was the Night Baazar again for us. Which suited us just fine. So that was it. A whistle stop tour of Chiang Rai's eccentric mix of attractions. Chiang Rai's relaxed atmosphere a welcome relief from the hectic Chiang Mai traffic. Definitely worth the journey. 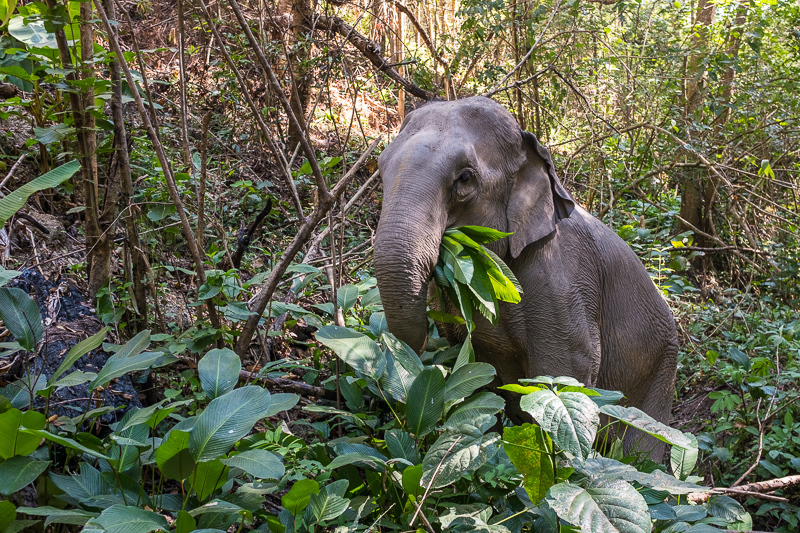 Choosing an ethical elephant experience. Older PostWant to Ride an Elephant? How to Choose an Ethical Alternative and Why.